Fig.1: HRTEM image of a CoFe2O4(5 nm)/γ-Al2O3(1.5 nm)/Co(10 nm) trilayer deposited directly on a sapphire substrate, and showing the exceptional quality of the fully epitaxial system (Coll. C. Gatel, CEMES/CNRS). The generation of highly spin-polarized electron currents is one of the dominant focusses in the field of spintronics. For this purpose, spin filtering is one very interesting phenomenon, both from a fundamental and from a technological standpoint, that involves the spin-selective transport of electrons across a magnetic tunnel barrier. Successful spin filtering at room temperature could potentially impact future generations of spin-based device technologies not only because spin filters may function with 100% efficiency, but they can be combined with any non-magnetic metallic electrode, thus providing a versatile alternative to half-metals or MgO-based classic tunnel junctions. The spin filter effect originates from the exchange splitting of the energy levels in the conduction band of a magnetic insulator. As a consequence, the tunnel barrier heights for spin-up and spin-down electrons are not the same, leading to a higher probability of tunneling for one of the two spin orientations. CoFe2O4 is a very promising candidate for room temperature spin filter applications thanks to its high Curie temperature (TC=793 K) and good insulating properties. Electronic band structure calculations from first principles methods predict CoFe2O4 to have a band gap of 0.8 eV, and an exchange splitting of 1.28 eV between the minority (low energy) and majority (high energy) levels in the conduction band , thus confirming its potential to be a very efficient spin filter, even at room temperature. 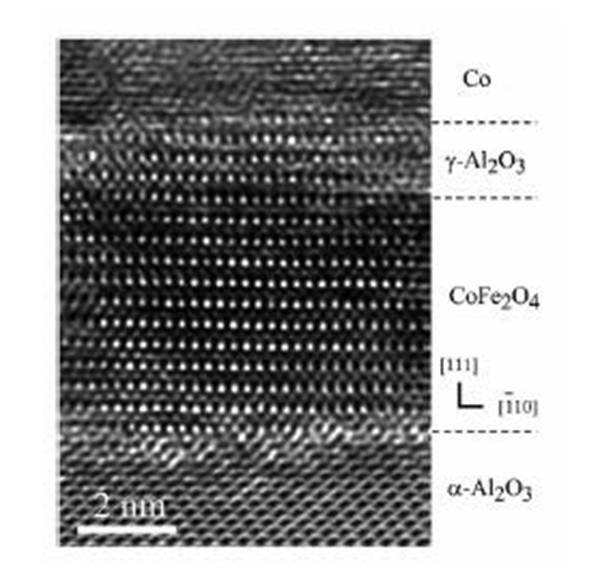 In order to accurately demonstrate the spin filtering capabilities of CoFe2O4 up to room temperature, we have prepared CoFe2O4(111)/γ-Al2O3(111)/Co(0001) fully epitaxial tunnel junctions by oxygen plasma-assisted molecular beam epitaxy (MBE) on Pt(111) underlayers. In this system, the spinel γ-Al2O3 serves to decouple the CoFe2O4 and Co magnetic layers. Before any spin-polarized transport measurements were performed on the full MTJ system, our CoFe2O4(111)/γ-Al2O3(111) tunnel barriers were carefully characterized by a wide range of techniques in order to optimize their structural and chemical properties. Fig.1 shows a high resolution transmission electron microscopy (HRTEM) study demonstrating the high crystalline quality of our CoFe2O4 (5 nm)/γ-Al2O3 (1.5 nm)/Co (10 nm) multilayers. In particular, we observe near perfect epitaxy in the single crystalline CoFe2O4(111)/γ-Al2O3(111) tunnel barrier, which is a consequence of the optimized growth conditions and the spinel structure of both constituents. 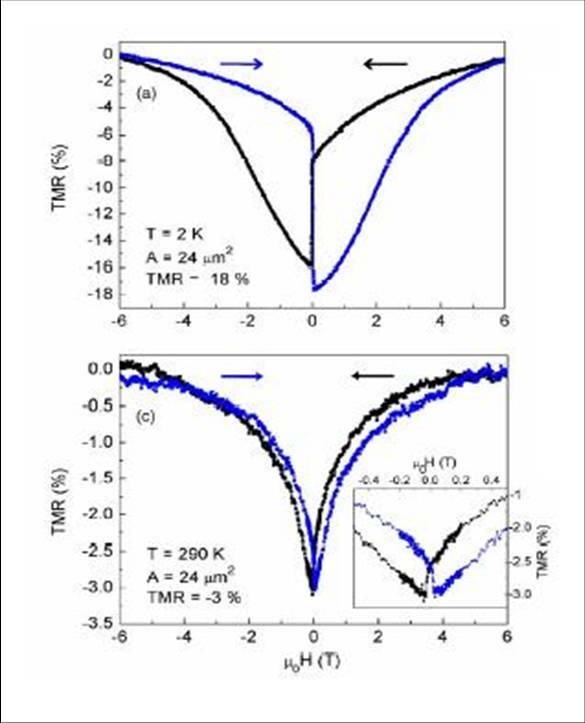 Fig.2: TMR as a function of applied magnetic field for a Pt(20 nm)/CoFe2O4(3 nm)/γ-Al2O3(1.5 nm)/Co(10 nm) tunnel junction at 2 K (a) and at room temperature (c) with an applied bias voltage of 200 mV. The junction area A was 24 micron2. A zoom of the Co switching at room temperature is shown in the insert of(c). Spin filter tunnel junctions were patterned by advanced optical lithography. Spin-polarized transport measurements were carried out in the two probe configuration, as the room temperature junction resistance was 3 orders of magnitude higher than that of the Pt cross strip and contacts. 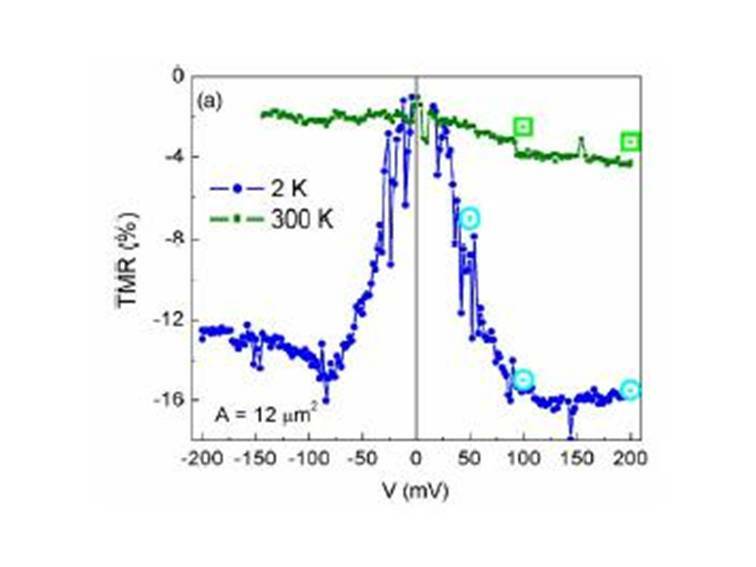 At room temperature the resistance-area product was 0.12 Ω­.cm2 and increased to 10 Ω­.cm2 at 2 K. Fig.2 clearly demonstrates the TMR effect in a Pt/CoFe2O4/γ-Al2O3/Co tunnel junction both at 2 K and 290 K. This result is direct experimental evidence of the spin filter effect in CoFe2O4 at low temperature and at room temperature. At 2 K, we calculate a TMR value of -18% using the relation TMR=(RAP-RP)/RP where RAP and RP are the resistance values in the antiparallel and parallel magnetic configurations. At room temperature, TMR = -3%. The abrupt drop in the TMR curve at ±200 Oe corresponds to the switching of the Co electrode, while the gradual increase back to ±6T agrees with the progressive switching and lack of saturation in CoFe2O4 seen in the magnetization measurements. The negative sign of the TMR indicates that the CoFe2O4 spin filter and Co electrode are oppositely polarized which is most consistent with the negative P predicted for CoFe2O4 in band structure calculations, and the positive P measured for Co by the Meservey-Tedrow technique. Taking PCo=40%, we may approximate PCoFe2O4 from Julliere's formula: TMR=2P1P2/(1-P1P2) where P1=PCo and P2=PCoFe2O4. This gives PCoFe2O4=-25% at 2 K and PCoFe2O4=-4% at room temperature. Fig.3: TMR as a function of bias voltage for a Pt(20 nm)/CoFe2O4 (3 nm)/γ-Al2O3(1.5 nm)/Co(10 nm) tunnel junction at 2 K and 300 K. The open data points correspond to TMR values obtained from R(H)measurements (Coll. R. Mattana, C. Deranlot, F. Petroff, UMR CNRS/Thalès). In addition, the I(V) curves taken in the antiparallel (±0.08T) and parallel (±6T) states may be used to extract the TMR bias dependence by using the definition TMR=(IP-IAP)/IAP. The result, shown in Fig.3, is a steady increase in absolute value of the TMR with increasing V up to a certain value, followed by a slight decrease for higher biases. This exact behavior was theoretically predicted by A. Saffarzadeh (JMMM, 269, 327 (2004)) to be the signature of spin filtering in MTJs containing a magnetic barrier, and has only recently been observed experimentally with EuS at low temperature. However, it has never been verified in higher TC magnetic oxide tunnel barriers. The increasing TMR(V) dependence may be explained by the spin-split nature of the conduction band in the spin filter. Upon the application of suffcient bias, the spin down electrons acquire a preferential tunneling pathway across the spin-down conduction band as it nears the Fermi level (EF). The result is an increasing TMR(V) dependence. However, when V is high enough that the subsequent spin up conduction band also approaches EF, the TMR ratio attains its maximum and then gradually begins to decrease. The onset of this decrease is likely precipitated by magnon effects in the case of the low temperature curve. The fact we observe an increasing TMR(V) dependence both at low temperature and at room temperature is a clear sign of the excellent quality of our CoFe2O4 spin filter. The onset of spin filtering, given by the region for which TMR increases with V, may be identified from the low temperature curve in Fig.3 around ±30 mV and persists until +130 mV (-100 mV) for positive (negative) bias. A.V. Ramos et al., Appl. Phys. Lett. 91, 122107 (2007).